This ATM Swooper Flag Provides Easy to Read Signage. This Message Banner is Ideal for Business Promotional Use! This ATM Swooper Flag is Ready to Ship. Single printed side dyed-through (mirror image on backside) for a highly visible banner. Metal ground spike for reuasable installation in different locations as desired. 14' Height and bold white text among a blue background for easy to read signage. This atm swooper flag that has white text is simple to interpret whether prospective customers are driving by or on foot. This sign is perfect for businesses that have automated teller machines within their establishment and desire to make customers mindful. This atm swooper flag allows business to ensure customers can find them and know what services are offered. Buyers of this sign can strategically place the banner by the road to pull attention from passerby customers. 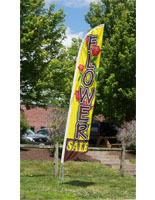 This advertising atm swooper flag, also known as a feather banner, includes a metal ground spike for outdoor installation. 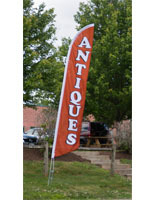 This tall feather shaped pennant flutters in the wind for an attention grabbing display. This atm swooper flag for businesses includes an aluminum pole that breaks down into four pieces. 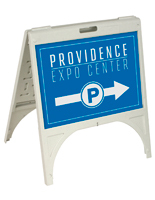 This sign provides affordable marketing for maximum visibility. This atm swooper flag includes everything for setup. This display is eye catching! This atm swooper flag is a low cost business marketing product! 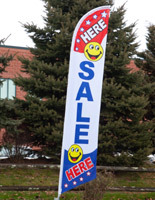 These banners are highly economical for small businesses. This message banner, atm swooper flag that is for outdoor use is tall to create a presence. This sign is sold at a wholesale price and is the simplest way for businesses to set up outdoor advertising! 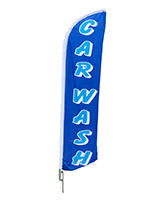 This blue atm swooper flag is ideal for informing customers of an establishment's amenities. 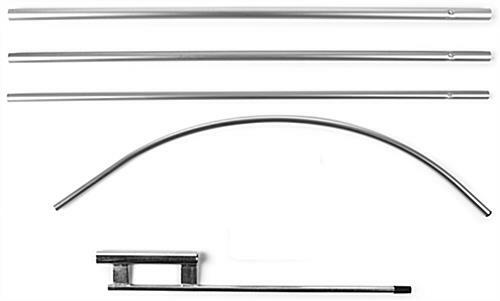 This kit includes a 4 piece aluminum pole that helps make this display so economical. Fiberglass poles bow more with the wind whereas aluminum poles keep their shape. 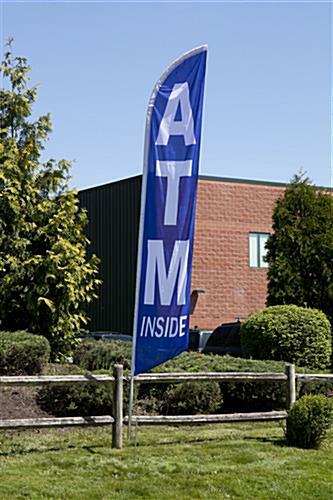 The aluminum pole included with this atm swooper flag is 1-1/8" in diameter and is durable for outdoor use. This feather shaped display has a white and blue color scheme. This atm swooper flag that comes with a ground spike can be reused in different locations as needed. 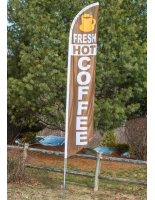 The stay open design allows potential customers to read the tall banner wether or not there is a breeze.